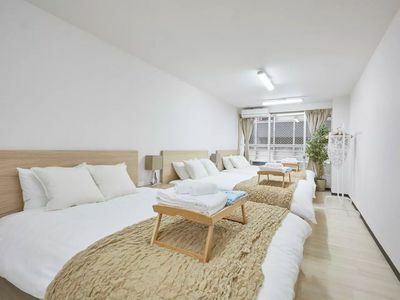 This is a large room with three double size bed, which is a just 5-minute walk from Shinjuku station. We provide a pocket Wi-Fi during your stay. *It has a usage limited. If you make a reservation, you can access to a description which has the detail info. about it. We provide the POCKET WI-FI device for our guests so you can reliably connect to the Internet wherever you are. Please dont change the setting. *The wifi is available 24 hours a day 365 days a year during your stay but the data amount you can use is limited and it provides 3GB every three days. If you use more than 3GB in three days, the wifi will reduce the internet speed. This room is an 5-minute walk from Shinjuku Station west exit. You can immediately go to many exciting spot, because it is among the most prosperous are near the "Kabukicho" in Tokyo. There is a very famous ramen,"Ramen Jiro" is on the first floor of the apartment. It is also possible to walk to Shinjuku and Seibu Shinjuku and Okubo Station, and because it is located in the center of Tokyo, you can also enjoy various sights and shopping and restaurants. This is a large apartment, with three double size bed, so you can comfortably stay with family, friends, and/or significant others. The room is equipped with everything you need for a short to long-term stay, so you can relax and enjoy your time in Japan! The two beds can comfortably accommodate up to 6 people. Let me know if theres anything else you may need! I'd be more than happy to provide it for you if I can. Room and balcony you can use all freely. It is a freedom out of 24 hours. Please be quiet in the balcony. There is no partition between the bed. It is of a large studio room. Hope you have a wonderful stay in Tokyo!